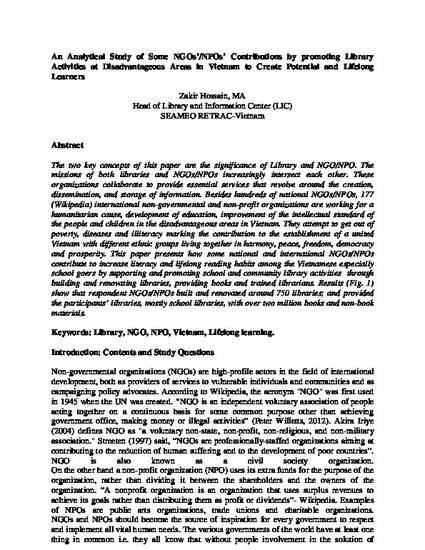 An Analytical Study of Some NGOs’/NPOs’ Contributions by promoting Library Activities at Disadvantageous Areas in Vietnam to Create Potential and Lifelong Learners. Baccaro, L. (2001), Civil Society, NGOs, and Decent Work Policies: Sorting out the Issues, The Discussion Paper Series Presents the Preliminary Results of Research Undertaken by the IILS in Geneva. Bundy, Alan (2006), Supporting Students: the Educational Contribution of Australia’s Public Libraries (FOLA). Busavo, I. Oluwadare (2011), The School Library as a Foundational Step to Children’s’ Effective Reading Habits Library Philosophy and Practice. Civil Society Participation in Poverty Reduction Strategy Papers (PRSP) Volume 3 (2000), (Ed. ): Vietnam Case Study, Report to the Department for International Development (DFID) Hanoi. Clark, J. (1995), The State, Popular Participation and the Voluntary Sector, World Development, 23(1), 593-601. Coe, E. M. (1892), The Relation of Libraries to Public Schools, Library Journal, 17, 193. Congress of Southeast Asian Librarians (2009), Library Coffeehouse Opens in Ho Chi Minh City, Vietnam, Friday, June 12. Dave, R.K. (1977), Reading through Libraries with Reference to Manipur: A Critical Study, Annals of Library Science and Documentation 24, (2), 82 -85. Dung Kieu Nhung (2011), Unlocking the Potential of Vietnam’s Libraries, In Asia (Weekly Insight and Analysis from the Asia Foundation). Fischer, J. (1998), Nongovernment: NGOs and the Political Development of the Third World, Kumarian Press. Hibbard M, Tang (2004), Sustainable Community Development: A Social Approach from Vietnam, Community Development Society, 87-105:35(2). Iriye, Akira (2004), Global Community: The Role of International Organizations in the Making of the Contemporary World. Islam, SKM (2004 “The Role of Libraries and Education” Information society Today Vol. 1 (1) 2004. Kaldor, M. (2000), A Note on Concepts - For the Global Civil Society Almanac Brainstorming, UK. Kunaka, Driden (1998), Libraries Promote Productivity if they have Qualified Staff: CornIa Bulletin, No.95-96. Lance, K.C. et al. (2000), How School Librarians Help Kids Achieve Standards: The Second Colorado Study. Denver: Library Research Service. List of International Non-Govt. Organizations (INGOs) Retrieved Information from the Site http://www.ngocentre.org.vn/ingodirectory July, 2012. List of Non-Govt. /Non-Profit Organizations in Vietnam, Retrieved Information from the Site http://en.wikipedia.org/wiki/List_of_non-governmental_organizations_in_Vietnam on July, 2012. Mapping Literacy Achievement: Results of the 1996 National School English Literacy Survey (Section 4: p. 207). Mokatsi, R. (2005), Sharing Resources- How Library Networks Can Help Reach Education Goals, East African Book Development Association, A Research Paper Looking at Libraries in the Developing World Commission by Book Aid International. NLV (2008), Vietnam Country Report, 16th Conference of Directors of National Libraries in Asia and Oceania Meeting. Norlund, Irene (2007), Ed. Filling the Gap – The Emerging Civil Society in Viet Nam, Hanoi. Norlund, Irene et al. (2006), The Emerging Civil Society – An Initial Assessment of Civil Society in Vietnam, Civil Society Index Shortened Assessment Tool, CSI-SAT Vietnam, Hanoi. Oduaran, Akpovire (2000), Globalization and Lifelong Education: Reflection on Some Challenges for Africa, International Journal of Lifelong Education, (270): Vol.19. Ogunsola, L. A. (2011), Libraries as Tools for Capacity Building in Developing Countries, The Journal of Library Philosophy and Practice. Rubin, Dorothy (2002), Diagnosis and Correction in Reading and Guiding Reading Instruction, 4th ed. Boston: Allyn and Bacon. Riker. J . (1995), Contending Perspectives for Interpreting Government-NGO Relations in South and Southeast Asia: Constraints, Challenges and the Search for Common Ground in Rural Development"N. Heyzer. J. Riker. A. Quizon (eds). Gov't- NGO Relations in Asia. Streeten P. (1997), Non-governmental Organizations and Development, Annals of the American Academy of Political and Social Science, (554): 193-210. Talk Vietnam (2007), Mobile Internet Library inaugurated in Ho Chi Minh City. Friday, January 19. Tawete FK. (1988), The Challenge of Libraries in the Third World, Libri, 38, 4: 330- 339. Vaughan A. (1989), Mission to Vietnam, Library Association Record, 91: 540. Willetts, Peter (2012), The Conscience of the World: The Influence of Non-Governmental Organizations in the UN System. Zimmerman MA, Rappaport J. (1988), Citizen Participation, Perceived Control, and Psychological Empowerment, American Journal of Community Psychology, 16: 725-750. 2009 CDNLAO Country Report by Vietnam National Library, Hanoi. The two key concepts of this paper are the significance of Library and NGO/NPO. The missions of both libraries and NGOs/NPOs increasingly intersect each other. These organizations collaborate to provide essential services that revolve around the creation, dissemination, and storage of information. Besides hundreds of national NGOs/NPOs, 177 (Wikipedia) international non-governmental and non-profit organizations are working for a humanitarian cause, development of education, improvement of the intellectual standard of the people and children in the disadvantageous areas in Vietnam. They attempt to get out of poverty, diseases and illiteracy marking the contribution to the establishment of a united Vietnam with different ethnic groups living together in harmony, peace, freedom, democracy and prosperity. This paper presents how some national and international NGOs/NPOs contribute to increase literacy and lifelong reading habits among the Vietnamese especially school goers by supporting and promoting school and community library activities through building and renovating libraries, providing books and trained librarians. Results (Fig. 1) show that respondent NGOs/NPOs built and renovated around 750 libraries; and provided the participants’ libraries, mostly school libraries, with over two million books and non-book materials. Zakir Hossain. "An Analytical Study of Some NGOs’/NPOs’ Contributions by promoting Library Activities at Disadvantageous Areas in Vietnam to Create Potential and Lifelong Learners."